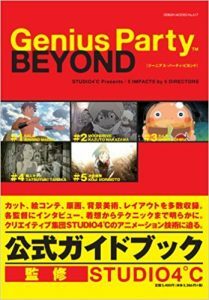 Genius Party & Beyond | Anime etc. How many anime fans are fans of animation – animation as a medium, whether it’s anime or not? There are some (just google “sakuga”), but perhaps not so many. Lots of anime fans like anime because it’s different from the animation they grew up with, especially Hollywood cartoons. Other fans like anime’s roots in Japanese culture, or what anime does with their favourite genres, like SF, action-adventure or fantasy. Genius Party takes an animation fan’s perspective. It’s a collection of twelve short films, mostly between ten and twenty minutes each. They’re all self-contained, by different directors, and encompass very different animation styles. 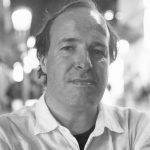 They were originally released in two blocks – Genius Party and Genius Party Beyond – but we’re treating them interchangeably here. The styles aren’t that radical; at least half are familiar from commercial anime. Some of them, though, are pretty odd and a couple of shorts look very strange. If you couldn’t get into Belladonna or Ping Pong the Animation because of how they looked, you may not like these odd fish either. Ping Pong was directed by Masaaki Yuasa, who contributes one of the films in Genius Party. In one interview, Yuasa said he can like a film that has a single interesting scene, even if there are many other things wrong with it. This is the mentality of many animation fans, especially those who see collections of short idiosyncratic films like Genius Party. (They’re often shown at animation festivals.) They don’t expect every film to be good; they expect a mix of triumphs and interesting failures. Some serious animation fans may complain that “Baby Blue” by Shinichiro Watanabe (Cowboy Bebop) is too conservative and mainstream in its style, but it’s still an exquisite piece. Two Japanese high-schoolers, a girl and boy, skip school to head out to the beach, but things go awry. It feels like a good Makoto Shinkai film – indeed, it covers comparable emotional ground to Shinkai’s 5 Centimeters per second, released the same year– but with a more rebellious sensibility. It also has a terrific last scene, as does “Gala” by Mahiro Maeda (Gankutsouo: The Count of Monte Cristo). This is a gorgeous Ghibli-esque fantasy about what happens when a giant UFO crashes into a mythological world. At first, you’re not sure what the film’s doing; then a brilliant reveal – hinging on a principle of fantasy that’s sometimes called “little big” – makes “Gala” hugely rewatchable. “Toujin Kit” by Tatsuyuki Tanaka has superb realist character animation. It’s the story of an anti-social girl and her toys, and feels like a nightmare of hikkikomori paranoia. Then there’s great anti-realist animation in two films about babies: Yuasa’s “Happy Machine” and Shinya Ohira’s “Wanwa’ the Doggy”. Yuasa and Ohira are revered as two of anime’s most idiosyncratic artists and both present far-out, scary adventures for infant heroes. Yuasa’s takes place on an alien world, with shades of Fantastic Planet. Ohira’s is a dream, with exhaustingly intense wobbly picture-book visuals. There are more kids in “Shanghai Dragon” by Macross creator Shoji Kawamori, in which Chinese elementary schoolers are caught in a mecha war that drops on their playground. It’s great fun, although the kids are so appealing that it’s a shame the film gets into mecha showboating so fast. A chilling suggestion that children’s imaginations could be weaponised for war might have been expanded into a whole series. The last of the standout films is the titular “Genius Party” by Atsuko Fukushima. It’s a brief but glorious fantasy of evolution, whose brilliant percussive music suggests an aboriginal myth. That leaves the also-rans. The CG “Deathtic 4”, set in a zombie world, has funny Belleville Rendez-vous-style gags but charmless characters. The shaggy-dog “Moondrive” feels like a Hiroyuki Imaishi anime (Kill la Kill) – it’s not – but has too little adrenaline to offset the meanness and pointlessness. “Doorbell”, about a boy and his double, is soporifically low-key. Of the two “unwatchable” films, at least both look good. “Limit Cycle” visualises the experience of reading an impenetrably abstract text of philosophy and theology, like the dense bits of Serial Experiments Lain turned up to eleven for twenty minutes. The visuals make more sense if you ignore the subtitles and play REM’s “Daysleeper”. The equally plotless “Dimension Bomb”, by respected animator Koji Morimoto, is a deeply annoying troll of a film that could only make sense as a backing visual in a nightclub.